Before I went away for Christmas, I spent 3 nights furiously Midnight Baking* special Christmas treats for my family, as well as the wonderful ladies and gents I work with. (Tip to young lawyers – a good relationship with your secretary, the search clerks and the photocopy guy are integral to your success!). *Midnight Baking means starting to bake after work – usually no earlier than 8.00pm – and not pulling the finished products out the oven until at least Midnight. Last year, I was more ambitious than ever with my Christmas baking frenzy. The Brooding Architect calls it “going over the top, as usual”. I baked double (or in some cases, triple) batches of mince pies, speculaas (a spiced Danish butter cookie) and gingerbread men. This resulted in around 300 little baked treats being forced upon workmates, friends and family – plus a plentiful supply of gingerbread men in the freezer. I think this year, I may need to go back to single quantity batches, or rope The Brooding Architect to assist me in the kitchen. 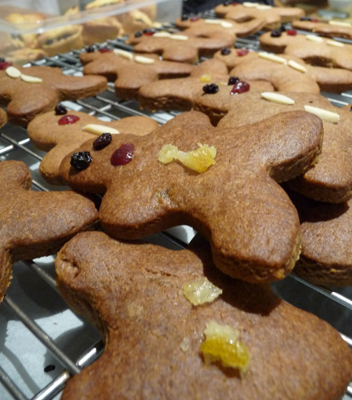 The Gingerbread Men recipe I used is a combination of Margaret Fulton’s and David Herbert’s gingerbread recipes – with the addition of treacle, citrus peel, brandy and extra spices for a more intense, spicy, Christmas-y flavour. You might want to leave out the brandy and citrus peel if you are making the Gingerbread Men for young children though. Gingerbread Men fresh from the oven at Midnight. Melt the butter, golden syrup, treacle, brown sugar, brandy, citrus peel and spices in a large heatproof bowl over a saucepan of simmering water. Stir until the butter has melted and the brown sugar has dissolved. The mixture should be thick and glossy. Add the bicarbonate soda. Remove the bowl from the heat as soon as the mixture begins to bubble. Set aside the bowl to cool. The mixture will start to ‘puff up’ slightly as it rests. Add the eggs and 1 cup of flour to the bowl and mix well. Gradually add the remaining flour, in 1/2 to 1 cup lots, and bring the dough together using hands. Knead the dough gently on a lightly floured board or kitchen bench, until the dough is soft and smooth. Divide the dough into four even sized portions and wrap each portion in plastic wrap. Chill for at least one hour. While the dough is chilling, preheat the oven to 180 degrees Celsius and line two baking trays with grease proof baking paper. Once the dough is chilled, roll a portion of the dough between two sheets of baking paper to 5mm thick. Repeat this process with each portion of the dough. If you are working in hot conditions (i.e. the Australian summer) and the dough has become very soft and difficult to handle, you may want to place the rolled sheets of dough in the fridge until firm again. Using gingerbread men cutters, cut out gingerbread men shapes from the rolled dough. Arrange gingerbread men on the baking tray. To decorate the gingerbread men, press currants for the eyes, a sliver of a dried cranberry for a mouth and citrus peel or almonds for buttons. Bake for 10 – 15 minutes, until starting to colour and firm to the touch. Total baking time will depend on whether you prefer soft and chewy – shorter baking time, or crisp gingerbread men – longer baking time. Allow to rest on trays for 5 minutes, before allowing to cool completely on wire racks. Store for up to 7 days in an airtight container. 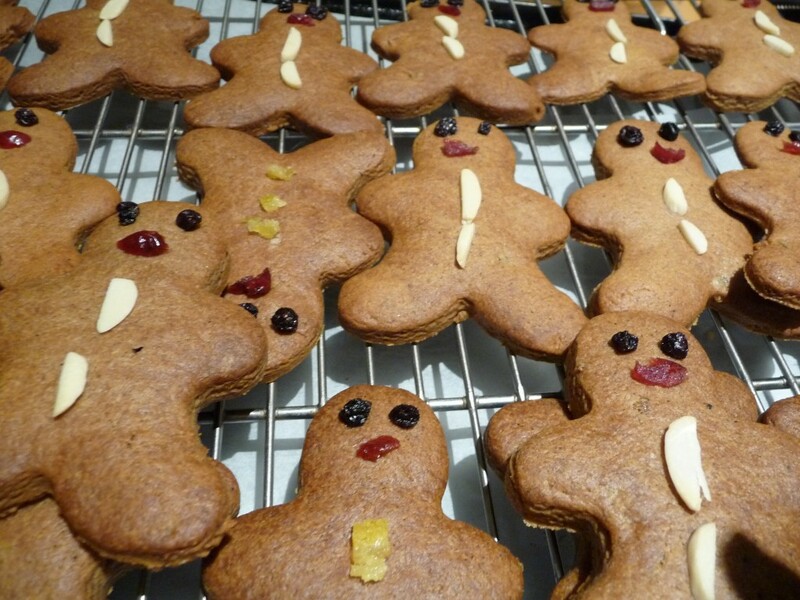 To re-crisp gingerbread men before serving, heat oven to 160 degrees Celsius and bake for 2 to 3 minutes.